Here's a video of me testing it. The word "Alexa" is filtered in the first play through, and not in the second. Everything else stays the same. Thought I’d have a play with how Amazon stop its adverts triggering people’s Alexa devices. Mumble the name, filter out 3-6kHz, and add background noise. 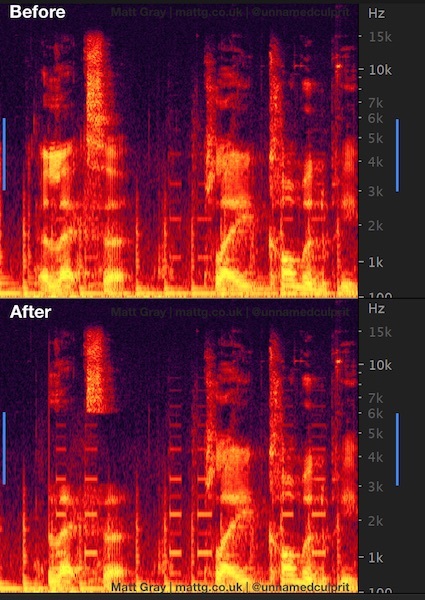 The first image below is a screenshot of the spectral frequency display in Audition, before and after I processed the sound of me saying "Alexa". 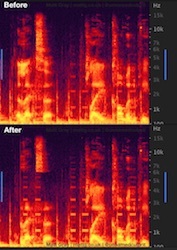 The bright orange is loud audio, and the gap in the after image is what's taken out by the filter. The second image is a screenshot of the multitrack project I used in the video. It looks like the key here is the combination of this filtering and the background noise. Without the background noise, it still triggered the device. Some light shuffling/wind noise made it ignore it half the time, and with background music too, it ignored it 90% of the time. When I only played the removed audio (just the bit between 3kHz and 6kHz), nothing happens at all. It barely sounds like speech to my ears. Follow Matt on: Twitter, YouTube, Instagram, Snapchat, Facebook, or Flickr. I don't have a comments box, so please tweet me if you've got something to say!